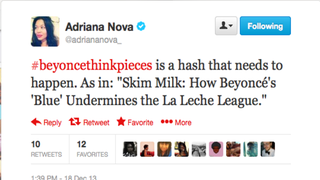 Tired of All the Beyoncé Analysis? Beyoncé's latest album has sparked some incredibly intelligent discourse, however, the productive conversations around it have been outmatched only by the overwrought think pieces it's also inspired, the titles of which I was beginning to confuse for Onion headlines on Twitter. Now let us all resume our collective listening session.